What does it take to get the final product in your custom built home? A talented, organized builder with a great team of sub contractors! 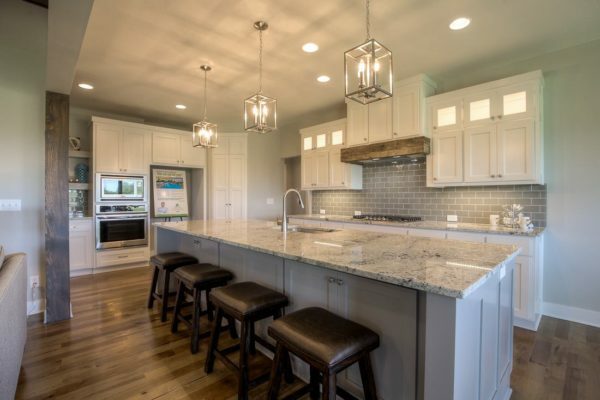 When you start your dream home project with Stewart Builders, we put you in contact with our team of experts…and give you a timeline of when each selection needs to be completed. Appointments are made to ensure that you get the uninterrupted attention you deserve! 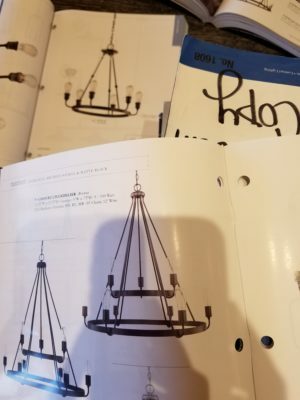 I’ve had many conversations over the past few years with other homeowners that said, “we signed the contract to build, and had no idea where we were supposed to pick items, or when we needed what completed…”. 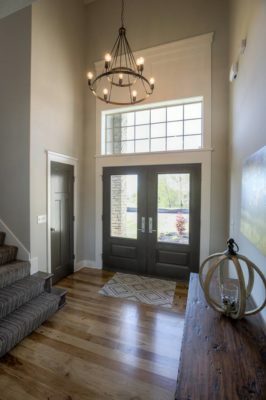 Stewart Builders strives to make the custom home building experience a positive one! Here is an example of the vision I had for the Model Home in Woodland Trails~ From magazine picture to installed and I love it!! A big THANK YOU to Premier Lighting in Lee’s Summit, MO for always helping make my visions a reality! With cabinet design being one of the first items of business…I always encourage our clients to provide LOTS of pictures! Calton Cabinet is fantastic at hood design, and is always up for new challenges and ideas! Once you meet with Steve Calton, he gets to work on creating 3D designs for you to review. This is the best way to “see” your kitchen & bath designs prior to installation, and gives you a chance to make any needed changes! 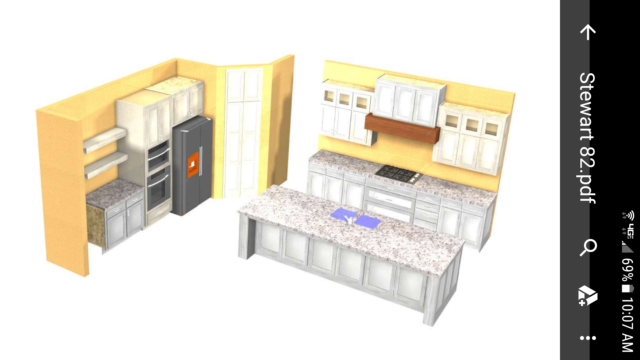 Here is an example of 3D images for our latest Model Home, and the beautiful completed project! 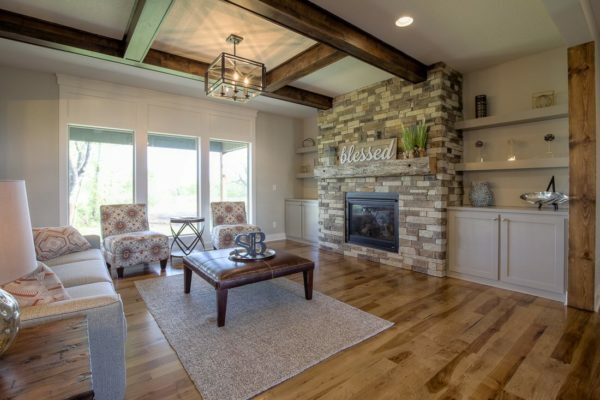 I really wanted to incorporate reclaimed beams for both the fireplace AND the hood…LOVE the end result! 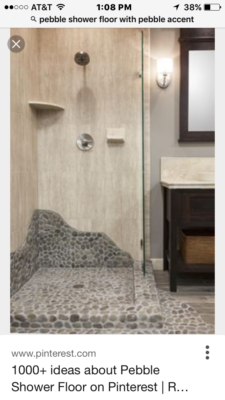 On to another very original and very custom idea for a master shower. These clients have been beyond awesome to work with, and have loved watching all their selections come to life! 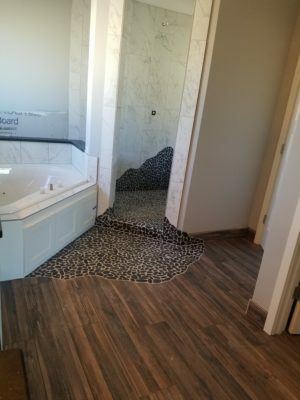 Below is the picture that she sent us several months ago, followed by the finished product (plumbing fixtures and glass shower doors/windows to be accented in chrome)! Stewart Builders welcomes new, custom ideas! We want you to not only love your custom built home, but we want you to enjoy the process as well~ Contact us today and lets get started on YOUR custom built home!